Advertiser.ie - Woolies, Wellies and Jobs to do! Woolies, Wellies and Jobs to do! Regular readers of Gardenwise will know that I’m firm believer in making your garden work all year round and in enjoying it for twelve months of the year. It’s very tempting as the days grow shorter and colder to retreat inside and forget all about the garden until spring rolls around. Whether we like it or not though, the garden’s still there and still visible from inside all winter long, even if we’re not spending much time outside. A little time and effort now will help keep things looking well throughout winter and beyond and ensure that the garden is ready to spring into growth next year, ideally without too much winter weather damage. Here are a few tasks you can be getting on with when you have the time – these are all ideal jobs for November and will make all the difference to your garden’s appearance. Just be sure to wrap up well and reward yourself with a hot drink by the fire when you’re done! Rake up fallen leaves – in a woodland garden, leaves can be left to break down naturally where they fall, enriching the soil over the years. If left on paths or paved areas though, they will get slippery and pose a hazard. 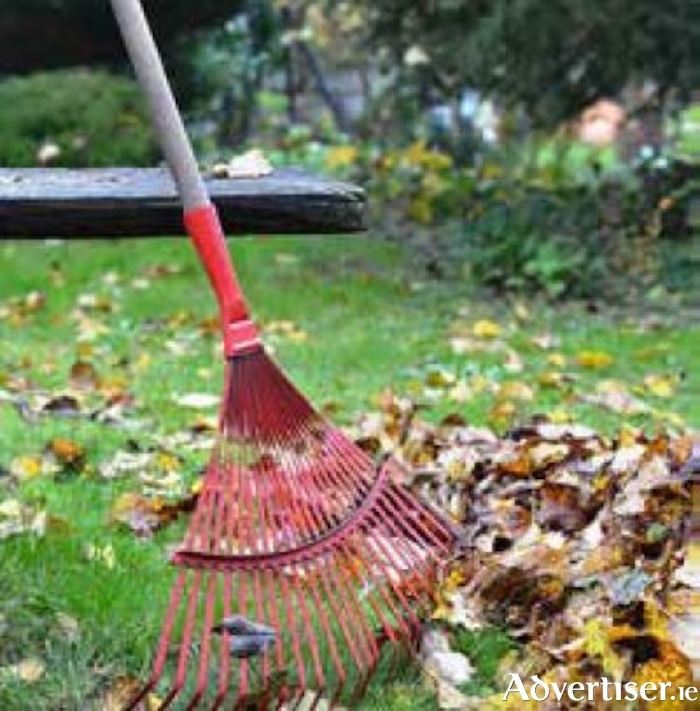 On your lawn, they’ll stop sunlight reaching the grass, thereby encouraging moss to spread, so sweep or rake them up and put them to good use. Small amounts can be added to the compost heap, but if you have large quantities, making leafmould is the way to go. Four tree posts in the ground with chicken wire wrapped around to make a sort of cage, into which you can tip barrowloads of leaves, is a really cost effective idea if you have the space. You can also pack loosely into bags and leave them out of sight to break down – just make sure the bags are ventilated. The resulting leafmould can be used as a mulch to prevent weeds and feed the soil. Climbing plants should have any new growth tied in now as winter storms can do a lot of damage. Remember to secure the string firmly to the support and loosely around the stem of the plant. Any newly planted trees, shrubs and climbers should be protected – even if they’re technically hardy, they might not be ready yet for the full rigours of winter, so a temporary windbreak or a couple of layers of horticultural fleece if it gets frosty will make all the difference to their progress next year. Make sure new trees are properly staked. Shrub roses should also be cut back by about a third by now – you can always do a thourough pruning later in the winter – to prevent windrock. Strong winds can cause damage to the roots if there is too much growth on top. Finally, remember the birds as winter sets in – they do so much to keep garden pests at bay and lift our spirits with their tiny voices – many of them depend on us during the winter months for their survival. Scrub down bird tables and wash feeders in a mild detergent to minimise the risk of them catching diseases. Now you’ve earned that hot chocolate – enjoy! Page generated in 0.0598 seconds.